Recently I co-led a workshop I created with my colleague Karen Pery. 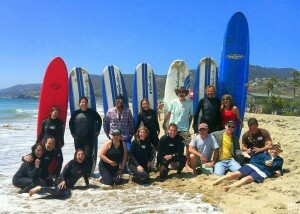 It was a daylong beach leadership retreat called Into The Fire Session (ITFS) held in Malibu California. It was one of the most enjoyable, amazing and worthwhile things I have ever done in my life. Karen and I have unique way of looking at the world. We are like a couple of six year olds wondering how we can find magic in the midst of everyday life. We imagine how play, awareness and connection can change how we feel about our experience, transforming our lives from being a grind to being a playground. Don’t get me wrong, we don’t have any illusions that life is all fun and games or that life’s not difficult at times or that there aren’t large swaths of pain and suffering we must endure. We believe that there is a way to feel life fully each day. We feel that if we pay attention to our experience we can go from a living a mundane existence to one that notices everything in appreciation. That we can learn to be less reactive and we can choose to be more gentle in how we respond to life’s annoyances. We feel to be human is to desire new, breath taking experiences. That’s why we combined surfing with a day of experiential learning to help people wake up to their lives. To start seeing how we have choice in how we decide to “do” our lives. Our day in Malibu was blessed with sun drenched skies, relatively warm water and loads and loads of dolphins frolicking up and down the coast. 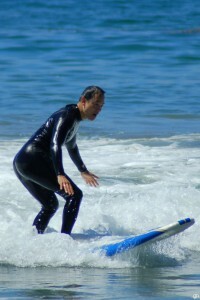 We had 16 excellent participants who all got wet in the coolness of the Pacific and who all became surfers that day. They also shared how easy it is to get stuck in a pattern and how they committed to living more and larger each day in greater awareness. We look forward to creating more Into the Fire Sessions in Malibu, Tofino BC, and Hawaii as well as other surf friendly locations in the world. If you missed the first one, don’t worry there will be plenty more.